I am now 24 weeks pregnant! Happy Viability Day to me! Seriously though, apparently, 24 weeks is what in the medical world they would class as the baby being 'viable,' i.e. if the baby were to arrive from now on, it would have a chance of survival. Also, I didn't know but legally doctors have to medically intervene at this stage to help keep baby alive if it were born. Obviously if he did arrive now, he would be very poorly and need lots of medical help, so god forbid he does. To be quite honest, this is all a bit miserable and depressing, but on the positive side I feel like we have passed the final major milestone (excluding birth!). The others being 12 weeks, dating scan, anomaly scan, 20 weeks and now 24 weeks. My next goal is 30 weeks and then after that it really won't be very long! (Hopefully) I really am hoping that he doesn't decide to stay in there too long after his due date as I am already very very impatient about his arrival and cannot wait. Literally it's worse than being a child waiting for Santa! So a few details about being 24 weeks (according to all my pregnancy apps): Apparently my uterus is now the size of a football(!) and has risen above my belly button. I can definitely feel this actually and it feels like it isn't far off the bottom of my ribs, which is worrying as I know potentially any day I could start with really bad heartburn! The baby is about 30cm long (the same size as one of those school rulers!) and weighs about 1lb-2lb. According to the baby centre app, he is the same size as a corn on the cob! He's starting to fill out this week with a bit of padding and his brain is growing very quickly. His skin will start to become less translucent from now. This is the time when pregnant women can find themselves becoming a bit clumsy and forgetful (the famous baby brain) and I definitely seem to have got that. My colleagues at work think it's hilarious as I can't remember anything and they know me as a bit of an OCD organisational freak. In terms of how I am feeling, I am definitely feeling more energetic. I am not sure if this is a weird coincidence but I was taking aspirin as I have high blood pressure and my prescription ran out so I had about 5 days where I didn't take a tablet. For those 5 days I didn't get one single headache and I felt better. So I told the GP and he said to stop taking them and since I have I feel tons better. I am not getting a headache every other day like I was and I feel less lethargic and washed out at work. The aspirin could have nothing to do with it, but whatever the reason, I am much happier! I am also filling out now. I am really struggling with clothes and have found dressing for work this week a nightmare! None of my trousers fit properly and not only that, but, the ones I can fasten up hurt my belly and make me really uncomfortable. I can no longer wear tights really, particularly black opaque ones, as I feel everything is being held in and it is horrible. I have found some gorgeous green coloured tights though yesterday in a knitted wool fabric, so I am hoping they will be ok. I bought a size larger than normal in the hope they will go over my bump. I did buy maternity tights but they ended up with the crotch at my knees at one point so I won't be wearing those again! I have bought a lot of clothes the past few weeks online and had to return them as they are not right - either too long, too big, too small etc! It's very depressing! Little movements have turned into massive kicks now and even though I can feel my uterus just underneath my ribs, the baby is still kicking low down. A lot of the time it feels like he is kicking my bladder - ouch! It's extremely uncomfortable! He tends to kick first thing in the morning in bed and last thing at night which I think is really nice - his way of greeting me in the morning and saying goodnight at bedtime. He also does kick though throughout the day, especially if I have a noisy class! I now have 10 working weeks left at work until maternity leave! I literally cannot wait. Although I know for the four weeks I have off before baby is due, I am sure to get bored... But I'm now finding work quite tough and I'll be glad when the time comes to say goodbye for a few months. I'm also finding that the last few weeks I am definitely getting very, very impatient and I just want to meet my little man. It really is like waiting for Christmas or a holiday when you were a child. But I still have the hubby and step-daughter's birthday to get to and indeed Christmas, before we meet our boy, so I still feel like I have a long way to go. It's only 16 weeks but it feels like forever. Speaking of weeks, I am really getting confused with how many months/weeks pregnant I am and how long is left. I can't decide if 24 weeks is 6 months pregnant or not, but I still have 4 months left...! So am I 5 months? argh, it makes my brain hurt to think about it. I think, to make it easier I am just sticking with weeks, all the medical staff go with weeks and I can work it out like that. I am going to start aqua natal swimming classes this week which I am quite looking forward to and I also have a midwife and consultant appointment this week, so hopefully I'll get to hear his little heartbeat again. I am definitely feeling more clumsy now and working as a waitress I am finding it very difficult! hehe. You are looking great but I know the problem with maternity clothes. It is a shame more there are not more places to try them on as there are some lovely bits out there! We use cloth nappies and are going to be doing them from birth this time too with squis (due Feb 2013) so looking forward to reading how you get on with them. Hope you stay feeling great and enjoy the next few weeks because the extra energy doesn't last nearly long enough! Hey ah thanks for taking the time to comment! I have heard lots of good things about cloth nappies, so I am hoping they have been a good investment. Which ones do you use? We have gone for Bambino Mio. Haha oh does it not? 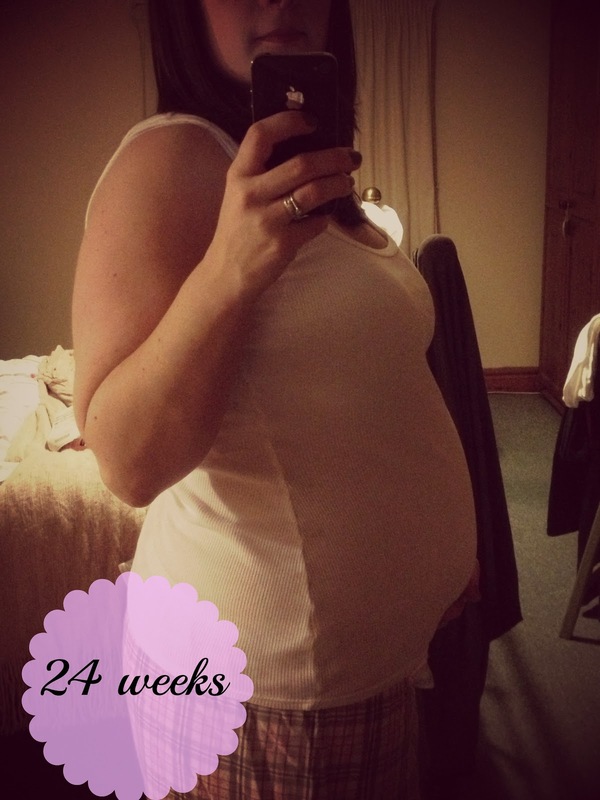 I had horrendous tiredness in the first trimester so I was glad to get rid of that! We live on the Isle of Man and there is one shop that sells mat clothes (Peacocks) and they are all horrid... :( HOping my orders work out well.